Two of the greatest horror directors, George A. Romero and Dario Argento come together here to bring us two films based on the stories of Edgar Alan Poe. First up is The Case of M. Valdemar which is about a greedy wife and her lover scheming to steal from her rich old husband. The plan goes awry and Romero treats us to a little zombie action but this isn't the greatest Poe story to base a film on and the production has that made for television sheen to it. The second film is a reworking of The Black Cat featuring Harvey Keitel as a really nasty piece of work. Argento gives this some real style with his skilled direction and although I wasn't keen on some of the plot points this was probably the better of the two. 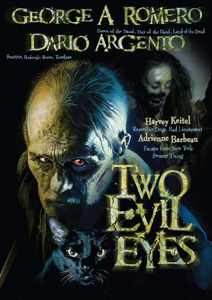 Both include references to other Poe works and they make for an entertaining double bill.